Edit note: I started this post first thing Friday morning... and I am just now finishing it. So much for the "free time" I thought I'd have today. haha! 1. Thanks to Joy Beyond the Cross, I've been diligant about my St. Andrew Novena... and I have already seen some amazing things happen. More on that later... but I am so grateful for the direction given by M at JBTC. It has been a wonderful addition to advent. 2. Christmas Celebrations! I love this time of the year but it gets so busy! This week I was able to go see my Godson in his Advent play. He's a kindergartener and got to "play" a wiseman. So sweet. 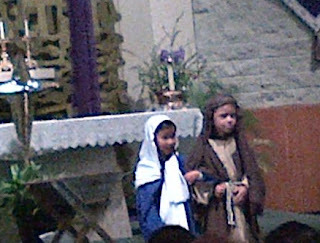 And look at the cute Mary and Joseph! I really try not to project into the future with my girls... I like to enjoy the stage that they are in but I couldn't help think about them in their first advent play. So cute! 3. Prayer buddy... I know you don't know me but I am thinking of you, praying for you, and mentally rooting you on! 4. What I don't love about this time of the year is colds and flus. Both girls seem to be sick. Mary Jane has a major cold she's fighting. Betsy seems a little off too. I hate seeing my girls sick. 5. Back to Christmas Celebrations... or holiday celebrations as it may be. I feel so blessed to have such a group of dynamic women in my adoption circle. We met for dinner this week after having a three month hiatus due to conflicts. We couldn't be more diverse.... Me- a Catholic and conservative when it comes to politics, K a liberal convert to Judiasm, S a Scientoligist (yes... she really is! ), O a former model who led the most jet-setting life I've ever know and who's husband is in the entertainment industry.... Oscars and all, L a Jewish Special Ed Teacher, and an A Evangelical Psychologist. We have joked that we sound like a bad joke.... "A Catholic, a Jew, and a Scientoligist walk into a room...". Anyway, I've known them for three years. They've challenged me in ways that have made me grow in my own faith. And they've been tremendous supporters as we've gone through adoption. While I often yearn for a community of like-minded Catholic mothers, I am completely blessed by our motely crew of adoption minded mothers. 6. My BFF called me crying hysterically today. I thought something tragic happened. Well... it did... at least in her world. She failed her Gestational Diabetes test. She was devasted. This is her third baby and she's never had a problem until this pregnancy. While from a medical standpoint, I am not terribly concerned, I am concerned for her and how she's handling the news. I hate to say she's just being hormonal... this has scared her and I will be praying for her to be blessed with calm as she readjusts her life to deal with this diagnosis. 7. Christmas break is here!! The mister (a teacher) just finished his last class. Three weeks of US! That's worth celebrating!